The Columbia 22 was produced from 1965 to 1972. 1541 were built. 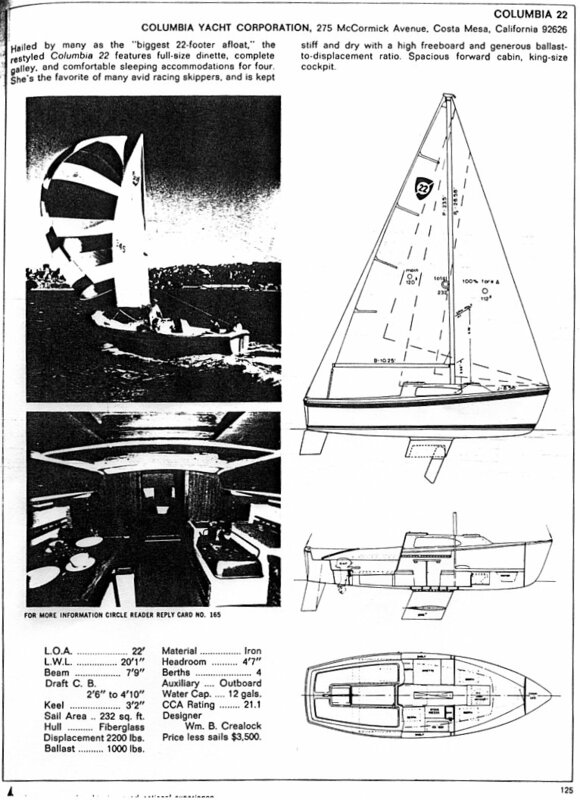 The Columbia 22 is a light displacement midget ocean racer (C.C.A. 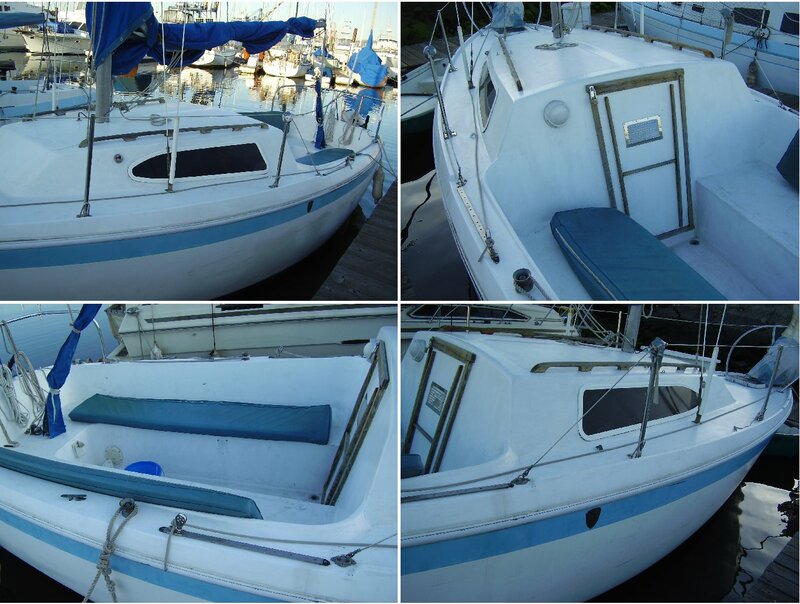 approximately 19.4) that sleeps 4, features a long waterline, large self-bailing cockpit, fin keel, and spade rudder. With the addition of the head, galley, and outboard power you are set to go yachting anywhere. 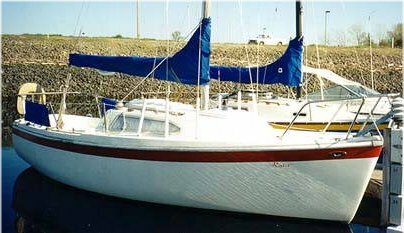 Her high freeboard and ballast to displacement ratio keep her stiff and dry. Roller reefing on the main gives all the sail control you need. Draft:  3' 2"            2' 6"          Up: 2' 6"
Displacement: 2200 lbs. 2385 lbs. 2385 lbs. Ballast: 1006 lbs. (iron)   1300 lbs. 1300 lbs. Sail Area:  232 sq. ft. The Columbia 22 was used as the basis for the Coronado 23 (not to be confused with the later Coronado MkII trailerable). "Our (1976) Columbia 22 was built in Australia. In fact right here in Melbourne by a company called International who had built them under license. Apparently they had some of the local sailers try them out in the local bay, Port Phillip, before they made a few alterations." Evidently, not all Columbia 22s were the same. The owner of hull 75 provided the following information: It has no hatches in cockpit, no engine well either. Got original sails. Just a baby hatch at forward for jib storage that only a kid could get through. No sliding hatch or poptop, just a simple door that takes your scalp and backbone. Inside it has vberth, two benches. The center toilet was removed a while back. No kitchen, no water, no sink. Here are some pictures.